Dr. Peter Marcus was born in Chicago, IL and moved to South Florida at the age of three. Dr. Marcus attended Nova Elementary School, Nova Middle School and Hollywood Hills High school. 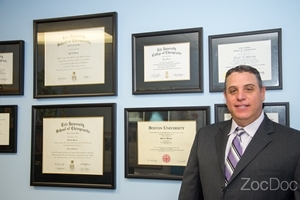 He subsequently attended Boston University where he received his Bachelors of Arts and then attended Life University’s School of Chiropractic, the largest chiropractic school in the world, where he earned his Doctor of Chiropractic degree. Dr. Marcus has been practicing chiropractic in the same Ft. Lauderdale location for approximately 15 years. Dr. Marcus has been married for ten years to his wife Jennifer and is the proud father of two amazing children Matthew and Samantha. 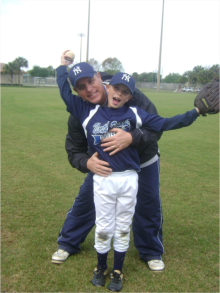 Dr. Marcus volunteers his time to coach his son’s football team, baseball team, soccer team and basketball team. He also coaches his daughter’s soccer team. Dr. Marcus enjoys spending time with his friends and family, traveling, reading, fishing and is a season ticket holder to the Miami Dolphins. In addition to successfully treating thousands of patients in the Ft. Lauderdale area, he has had the honor of treating a Hall of Fame baseball player, professional and Olympic athletes, well known musicians and well-known actors. Dr. Marcus is presently on call with the Broward center for the performing Arts to treat performers that are in need of chiropractic care. Dr. Marcus presently runs a family practice with a concentration on traumatic injuries. He hosts various radio talk shows educating the public on the causes, treatments, and prevention of back and neck pain. In addition to providing patients a comprehensive examination, x-rays, physical therapy and chiropractic adjustments, Dr. Marcus may utilize MRI’s, CT scans, and other diagnostic tests to diagnose injuries with a goal toward finding the cause of your pain and providing fast pain relief and wellness. Dr. Marcus also frequently works with your primary and orthopedist for your benefit and does not hesitate to refer out when the condition is out of the scope of chiropractic. Dr. Marcus is presently an active member of the Florida Chiropractic Association, Florida Chiropractic Society and the National Board of Chiropractic Examiners. Diana has been managing medical and chiropractic offices for over 10 years. She is exceptional at managing patient scheduling, medical referrals and insurance verification and claims. She is an expert in personal injury case preparation and management and is a registered chiropractic assistant with the State of Florida. Diana will likely be your first contact at the Marcus Chiropractic Center and would be happy to answer all of your questions or address any concerns you may have. Jennifer has been a medical assistant/x-ray technician at the Marcus Chiropractic Center for over fifteen years. She assists Dr. Marcus, the manager and therapists with all aspects of office management and patient care. Danielle has been the head therapist at the Marcus Chiropractic Center for the last eight years. She assists Doctor Marcus with all aspects of medical care, administers physical therapy and manages the patients’ medical charts and reports. She possesses a rare combination of therapeutic skill with unmatched patient sensitivity and warmth. Danielle is also a registered chiropractic assistant with the State of Florida. Marc has been a massage therapist with the Marcus Chiropractic Center for the last ten years. Marc has been a massage therapist for thirty years treating everyone from children to senior citizens. He also has extensive experience treating traumatic injuries and has had the honor of treating many professional athletes. Marc also consults with patients regarding nutrition, spiritual healing and the power of positive thinking. Connie has been a massage therapist at the Marcus Chiropractic Center for five years. Connie can remove every drop of stress and tension from your body with a Swedish massage but also has the strength to perform deep tissue and sports massage to remove muscle spasms and trigger points. Connie leads women’s spiritual groups and has experience working with the mentally and physically disabled. As soon as Connie puts her hands on you you can’t deny her healing energy.